Line a 20cm square baking tin with baking paper. Put 200g of chocolate, butter and syrup in a heat-proof bowl and melt over a bain-marie. Once almost melted, remove from the heat and gently stir until any tiny bits chocolate have melted. Allow to cool a little. Place the biscuits in a freezer bag, seal and crush with a rolling pin or use a mini chopper. You want mainly crumbs but a few small chunks of biscuit is fine. Combine the biscuits, M&Ms, raisins and marshmallows with the melted chocolate and stir until everything is coated. Press into the prepared tin and make the topping. For the topping, melt the chocolate, butter and syrup as before and spread evenly over the biscuit base. Cover the tin with cling film or foil and refrigerate for 1-2 hours before cutting into squares. 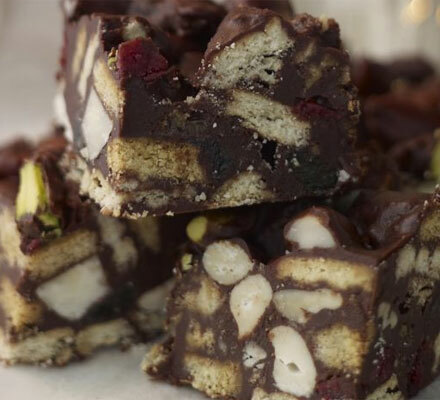 You can use anything you like for the filling – maltesers, cut up chocolate bars, dried fruit, nuts. Make it to suit your tastes. Gallery | This entry was posted in Recipes / Food and tagged Chocolate, Chocolate Tiffin, Food, Fridge Cake, Recipe, Snack, Tiffin, Treats. Bookmark the permalink.